This volume makes readily available for the first time a critical edition of The Doctrine of the Hert, the fifteenth-century English translation of De doctrina cordis, a thirteenth-century Latin devotional treatise addressed to nuns. A religious bestseller, the Doctrina circulated throughout Europe between the thirteenth and fifteenth centuries and was translated into six different languages. The Doctrina progressively pairs the seven gifts of the Holy Spirit with seven key actions of the heart, leading readers toward contemplative unity with God. Despite its medieval popularity, the Doctrina has largely escaped the attention of scholars until recently. Exeter’s edition offers a full textual commentary, while its introduction not only examines current thinking upon the Doctrina’s authorship and envisaged primary audience, but also takes advantage of recent scholarly breakthroughs in the understanding of late medieval female spirituality. Christiania Whitehead is a Senior Lecturer in Medieval English Literature at the University of Warwick. Her fields of interest lie in medieval allegory and female spirituality. Denis Renevey is Chair of Medieval English Literature and Language at the University of Lausanne, Switzerland. He has published widely in the field of vernacular theology and female religious writings. Anne Mouron is a fellow in English at Greyfriars, University of Oxford. She writes on late medieval devotional literature. 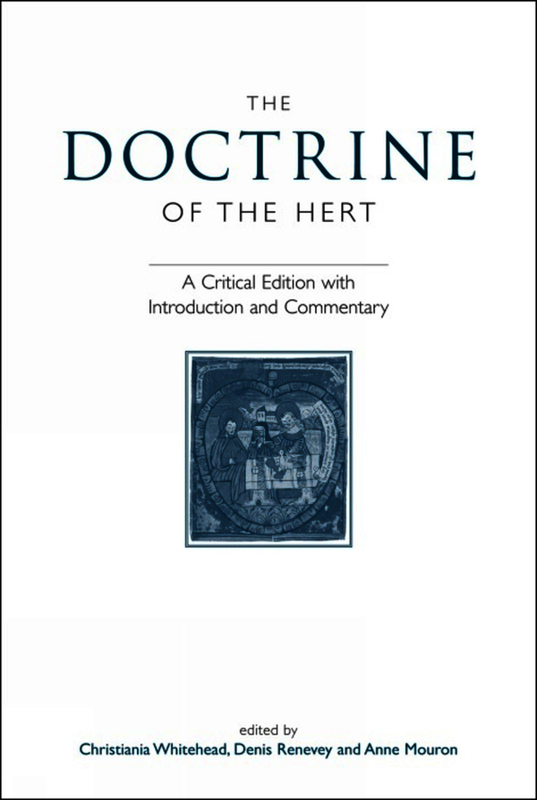 This volume makes readily available for the first time a critical edition of The Doctrine of the Hert, the fifteenth-century English translation of De doctrina cordis, a thirteenth-century Latin devotional treatise addressed to nuns.A religious bestseller, the Doctrina circulated throughout Europe between the thirteenth and fifteenth centuries and was translated into six different languages. The Doctrina progressively pairs the seven gifts of the Holy Spirit with seven key actions of the heart, leading readers toward contemplative unity with God.Despite its medieval popularity, the Doctrina has largely escaped the attention of scholars until recently. Exeter’s edition offers a full textual commentary, while its introduction not only examines current thinking upon the Doctrina’s authorship and envisaged primary audience, but also takes advantage of recent scholarly breakthroughs in the understanding of late medieval female spirituality. An important addition to the corpus of medieval spiritual literature in the vernacular... it should enjoy a wide readership among all those interested in medieval mysticism and spirituality. These two complementary volumes together fill a major gap in the ever-burgeoning fields of late medieval devotional literature and of medieval women’s spirituality. Students of medieval devotional literature and of medieval women’s spirituality will want to own the Companion as well as the edition of The Doctrine of the Hert. A significant resource for students and scholars of medieval mysticism.